When Lot 337 was knocked down at a bid of $1.7 Million on Wednesday, he became his breeder Tyreel Stud’s first million-dollar yearling, his sire Exceed & Excel’s most expensive yearling ever and the sale topper of Day 2 of an epic edition of the Inglis Easter Sale. This life changing yearling was a cataloged as Lot 342, a colt by Exceed and Excel from Written Dash. Exceed and Excel has been having an incredible resurgence this season, just last Saturday his son Microphone won the Group 1 Inglis Sires at Randwick, his 2 year old’s dominated the Randwick 2 year old features on the day with Bivouac victorious in the Group 3 Widden Kindergarten Stakes. Linda and Laurence Monds took over Tyreel Stud in 2014 and with their family and dedicated team including farm manager Rob Simms they have worked tirelessly to produce quality horses and build their reputation and brand within the industry. 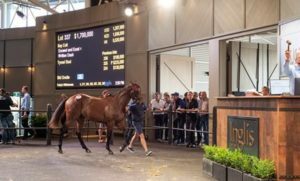 Lot 337 stimulated a tense bidding battle between several of the industry’s heavy hitters on Wednesday with Aquis Farm eventually winning at $1.7 Million. Completely exceeding all expectations, the $1.7 Million price saw Tyreel Stud achieve their milestone first million-dollar yearling. Belmont Bloodstock have been working with Tyreel Stud since 2015, consulting on mare matings, purchases and sales selections. At the 2016 Magic Millions National Broodmare sale, Belmont Bloodstock along with Tyreel Stud selected Lot 337’s dam Written Dash from Newgate Farm’s draft. Written Dash is a Group 3 winning daughter of Written Tycoon. She is out of Dash For Cash mare Dosh Dash who is a half sister to Masthead who was 3rd in the Blue Diamond and 4th in the Golden Slipper. At the time of purchase, she was carrying a first crop Brazen Beau pregnancy. Written Dash was a standout physically and it took a final bid of $410,000 to secure her. Her first foal a Brazen Beau colt topped the Inglis Classic Gold Riband Session when selling for $480,000 to Orbis Bloodstock. He was the most expensive first crop Brazen Beau sold. Now named Potentia, he is in training with Kris Lees. With the second foal by Exceed and Excel selling for $1.7 Million, the total return for Written Dash’s first 2 foals is $2,180,000. This is $1,770,000 profit after the initial purchase price of $410,000, obviously there is the Exceed & Excel service fee to account for as well as the daily maintenance costs of the mare and raising the foals but it proves to be an exceptional return on investment. Written Dash has a 2018 colt by I Am Invincible and is back in foal to I Am Invincible. Congratulations to the Tyreel Stud team on achieving elite results in the sales ring and on the exceptional presentation on their yearlings. Belmont Bloodstock hope to continue work with you to strive for more results like these in the future.